My "prom anxiety" has dissipated a bit. It helps that my daughter does not seem at all worried about her dress being finished in time. After the prep-work, I do feel rather confident about dying the fabric perfectly, and expect to move through the dress construction fairly quickly. Still, I will feel much better when the package of silk arrives! My package from Nancy's Notions did arrive. 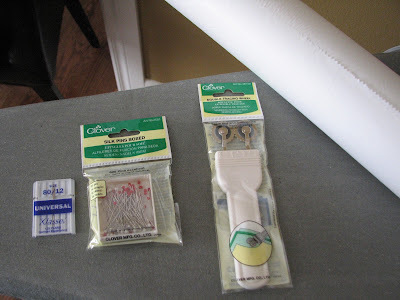 I ordered some silk pins, a double-headed tracing wheel and splurged on a big roll of tracing paper (instead of using the cheap tissue paper and taping it together, as I always have). As usual, the box contained a bonus sewing machine needle. My previous package from Nancy also included cat treats, a very random bonus. The dogs enjoyed them, though. Unfortunately, the tracing wheel didn't leave any marks on the paper. Maybe it's the transfer paper I'm using? How disappointing! I purchased it in anticipation of making Burda 135 02-13 to assist with the seam allowances. I will be sure to wear a bra with my version. It looks so comfy! I bought a lovely purple rayon crepe for the main fabric, but haven't decided what contrast to use at the neckline and cuffs. If I were doing it for SWAP, I would use some brown satin from my stash (and still may do that). Although I will very likely not finish SWAP by the April 30 deadline, I am still sewing my plan. Such a good idea -- sewing with a plan. Why didn't I think of that earlier? While anxiously awaiting the mail delivery, I sewed the fasteners on my brown pants that I almost completed a month ago. I suppose I can hem them next. It has been calming to do a little hand-stitching here and there. The RPL from Gorgeous Fabrics was a dream to sew with. I'm sure it will be just as dreamy to wear, too! 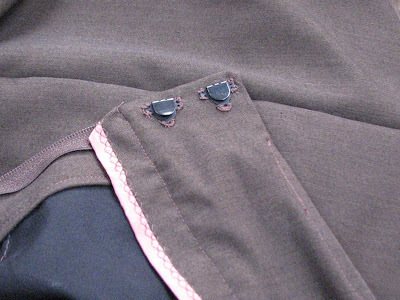 I had some fun with the waistband, using pink satin ribbon to finish the inside edge with a fun machine stitch. A whimsical touch that only I will see.